My stash report is very boring this week. Nothing new in, nothing new out. As I stated in my previous post, it was a stressful week last week, between my son having hives, and getting caught up in some stupid drama at work. And tomorrow starts a new work week. I hope it’s a better one. I’m usually pretty good at keeping up walls, but occasionally let those down a bit. The events of last week have me feeling it’s time to reinforce walls again. I’m feeling in “retreat & retract mode”. In the meantime, I’ll give you a sneak peek of how I spent 5.5 hours of my Saturday. This cutie also belongs to my friend Betty, the owner of the previously posted Pumpkin table runner. You make quilting so much fun! Love your work on this quilt! Wow–your quilting is just awesome! 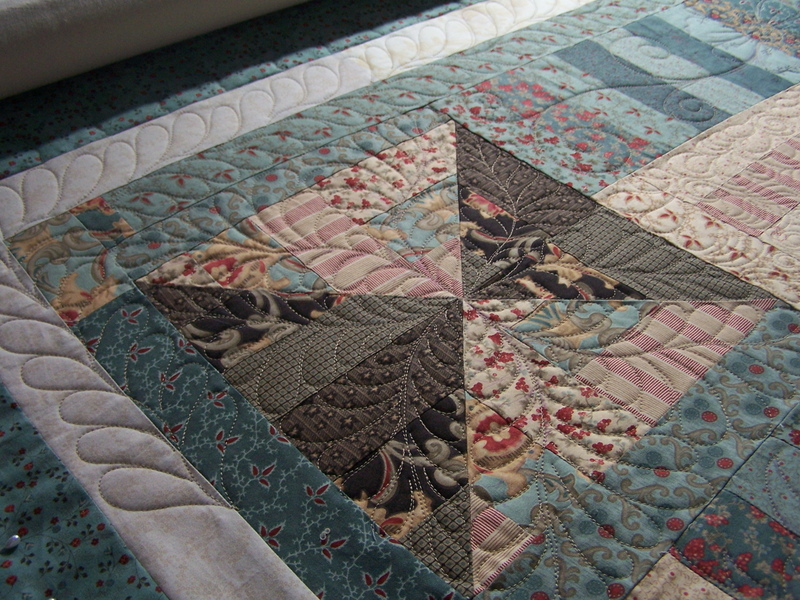 Stay quilting to keep you in a good frame of mind away from that drama stuff! Get those boundaries reset Randi and don’t let anyone drain you of your positive energy. You freehand quilting is just marvelous. Another work of art. I love studying how you get from A to B. Good luck with the drama queens this week… it is so emotionally draining. I hope your son is feeling better, too. I think my week may have been a bit like yours. Found a very helpful reading called the garbage truck. Was on backyard quilts……and I used it in my blog…and gave ref back to original source. Am over it now but I know that retreating feeling well. 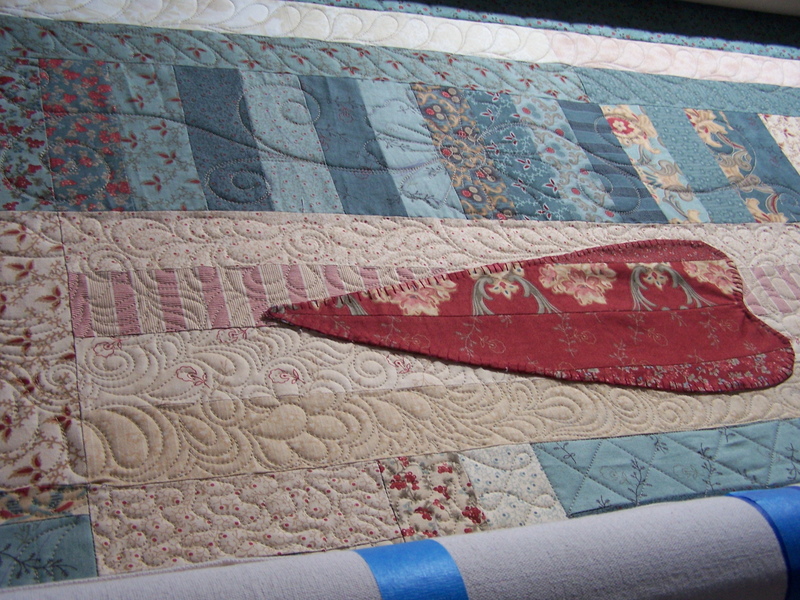 Love the quilting……but that is a given….. I love the garbage truck saying. I will try to remember it often. Life is like that. so it will be good to remember! Beautiful quilting! I am currently putting this pattern together. Was a jelly roll used or was fabric from a stach used? If a jelly roll was used, which fabric line? That’s an incredibly beautiful quilt, and your quilting just enhances it that much more. I really love the colors in it. Beautiful quilting, Randi. If you lousy week inspired you, perhaps it wasn’t a total loss. 🙂 I love the border with the large flower and swirls. If I had your address, I’d send you Ghiradelli Hot Chocolate; it’s great to fortify oneself before heading to work! I know I’m pretty late at looking at this, but I just wanted to say, boy, is your quilting beautiful!